for the moment, (well for the last 24 hours) pinned to the photo station. Nothing has been worked on it. The washed laundry has been all folded and put away, or hung up (yeah!) The bathroom got hosed down (well not literately, but you know what I mean). The dishwasher filled, the sink and drain board emptied and counters in the kitchen got cleaned too. (Still to do—scouring the kettle). A favorite linen skirt got undone (seams opened) to be cut down and made smaller. Linen is so worth the effort. In short—stuff besides knitting got done. Not that there wasn't knitting-- The secret socks had a good inch added, and then the ribbing got started. Less than a half inch or ribbing so far. I got out for the evening, too. I need to find a nice bag for the peacock project, too, and to fit it with some markers. 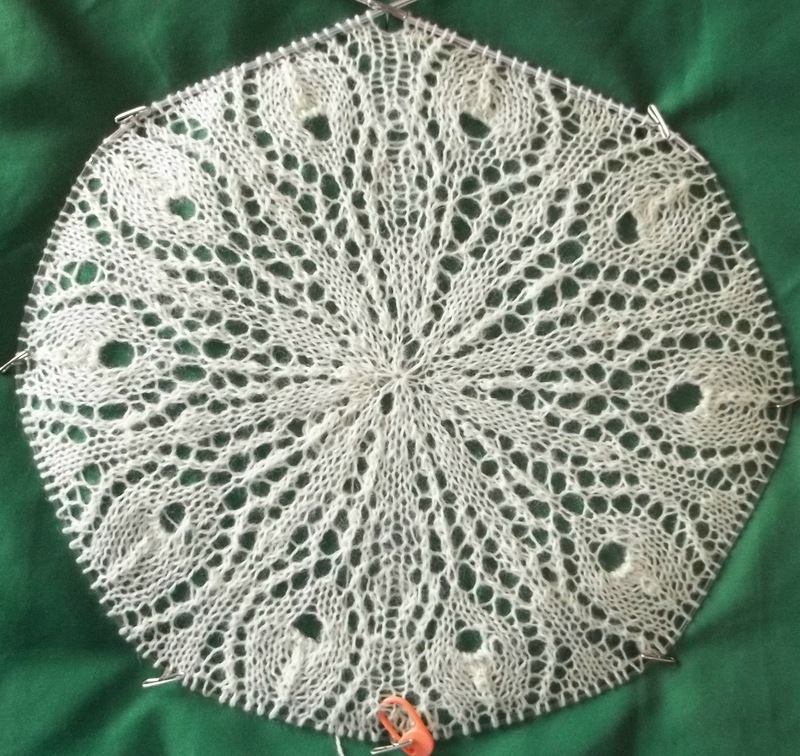 The open lace pattern of the stem that begins the next motif is just complex enough that I want some markers. 10 I think to start. I looked closer at the charts—there will be 3 new feather motifs for every current 1--(or 30 per round) The first set feathers were divided into half--(note the marker at the point opposite the needle tips). 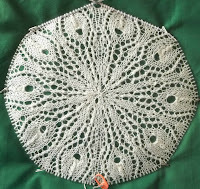 For lace like this, I need some long soft cotton embroider thread markers—the kind that get enmeshed into the knitting. (Slip on the needle markers are too likely to also be slip off the needle markers) and a Beginning of Round marker, (no there isn't one, yet) –the small safety pin marker will become that. There are a lot more stitches now—180 to be precise when the motif is finished. 1 marker every third repeat of the chart/pattern should be enough to keep me on track. I am not going to think about how many stitches there will be by the end of the chart! Well the secret sock isn't going to knit it's self—Enough time spent on the computer. It's time now to knit! Sounds like you've been busy! Have a great weekend. You must have a will of titanium to be able to resist knitting exclusively on that shawl!